Game #1 (officially game #2 when you include Florida) of the college football quest was a headline matchup. This was a game that I targeted from the start. When this quest was conceived in late summer 2008, my first step was to look at the Florida bye weeks and see what games were being played during those bye weeks. This game jumped off the computer as a game I could not miss. There is a risk in this quest of planning games over the summer before each season, so that games that look like good ones turn out to be anything but. I thought this would be a matchup of undefeated teams and it would have been a #1 vs. #2 matchup if Missouri did not “screw the pooch” (did Jarrett really just say that) the week before against Oklahoma State. Instead, I had to settle for #1 Texas versus #11 Missouri. But the game did warrant significant attention as this was the site of ESPN Gameday for the week. 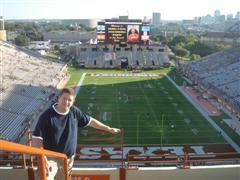 Austin, Texas is a city that has been featured very prominently as a great city to live in and a great college town. As such, I wanted to leave plenty of time to see the city. So the first quest game became a weekend trip as I left Thursday morning. The flight from JFK to Austin was uneventful, but one thing did stand out…not a sole on the flight wore anything related to the University of Texas. My history of flying from NYC to Gainesville, Jacksonville, or Orlando for Gator games has shown that there is always someone with Gator gear on heading to the game. Some flights to Gainesville have had almost the entire plane flying down for a game. This was glaringly not the case going to Austin. We arrived into Austin late Thursday and the first odd thing happened. While we did not stay in the middle of the city, we had problems finding a place to eat at 10pm, let alone the BBQ I craved. This seemed odd for a college town on a football weekend. Friday was tourist day. We toured the Capital Building, LBJ Presidential Library, and walked around the city. I had the thick black socks pulled up high with my shorts, camera around the neck, and maps out of every pocket. I am not a sightseer but I do enjoy exploring other cities so it was a fun day. During the day, Al took what will be many pictures of him sitting on a cannon. There is something inappropriate about that, but I am not quite sure what it is. Friday night had us at the first sporting event of the quest, a women’s soccer game. This was a must see game for all of the obvious reasons. Enough said. Friday night was yet another day that we could not find a BBQ joint, but we did have lunch at a good Thai place. I had decided that as part of this quest, I should get a postcard from each school of the stadium from an aerial view. This would be a nice thing to have in my scrapbook from each game. However, I was shocked to learn that this would fail at game #1 as I could not find this postcard in all of Austin. Therefore, we relied on Al’s camera and I have given in to the fact that I will just need to find a picture of each stadium on the web for my scrapbook. 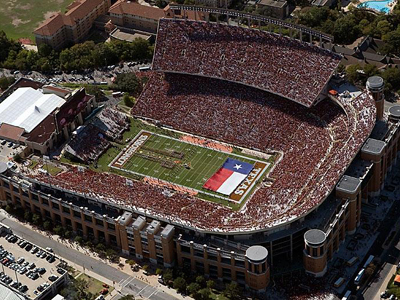 It was shocking that this was not an easy purchase at any stadium, no less a premier one like Texas, but so be it. In Al’s not so humble opinion, he thinks an actual picture that we take should be used, but I will dismiss that as bunk. Saturday was game day. 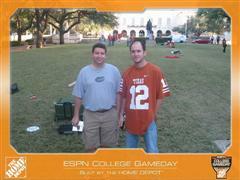 We got up and went to campus for College Gameday. There are a lot of odd folk who go to Gameday. Some that even follow Gameday around the country. But I guess you do get to see a marquee football game each week if you do that. But there are a lot of people who support teams that are not playing on that site that show up, specifically; LSU and Washington State. LSU makes sense because they are good, but what is that Washington State guy doing each week. Observations from Gameday; lots of cowboy hats and boots. Thus begins Al’s obsession with cowboy boots. After Gameday, we wandered around campus awhile. This campus has a lot of steps. It is a very nice campus although the “talent” appeared to be disappointing compared to expectations. We also toured the clock tower on campus. 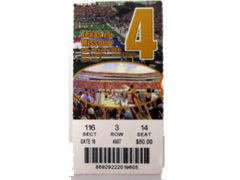 This was a tough a ticket on game day almost as much as the actual game ticket was. But it did offer a great view from up above. As game time approached, we made our way to the stadium. A very nice stadium from the outside, it proved very nice inside as well. The concessions, aisle ways, and other stadium amenities were very nice. 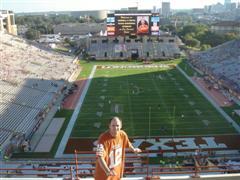 It could have been because we sat in the new end zone, but I was very pleased with all the stadium had to offer. Our seats were excellent, chair back seats in the third row of the upper deck in the end zone. Perhaps I should digress here and explain my odd seating likes for football. Like most, I had always preferred sitting on the 50 yard line. During my senior year at Florida, I took a coaching football class. This was not the joke of a class that it may seem, but I will never convince anyone of that and continue to take much abuse for my course load at Florida, despite the fact that it is unwarranted. You actually had to do a lot of work building a playbook and scouting an opponent. One of the major projects of the class was to prepare a scouting report. You had to attend the spring game at Florida, chose a team to scout, and prepare a scouting report as if your team was playing that team next week. We were taught how to do this and things to look for etc. Ever since, I have felt that sitting in the end zone up high offers the best view to see what is happening on the field, what play will work best against each defense, who will be open on any given play and what route will work best. Yes you give up seeing up close at one end of the field, but I feel you get more than you give up. Thus, my ideal seat is the end zone, first row, upper deck. Back to regular scheduled programming… The game itself was somewhat disappointing as Missouri was never in it and Texas led 35-3 at halftime finally winning 56-31. The stadium was loud but not overly loud. My guess is this was due to the fact that Missouri was never in the game and it seems like there is a lot of room for noise to escape from between the stands. I can see this being an intimidating place to play, but not one of the loudest in the country. Again, I hedge as it is tough to sample from one game that was a blowout, but it was a night game billed as a big game. What did impress me was that the student section stood the entire game. If it was a close game, this would have been expected. But in a blowout, this is impressive. 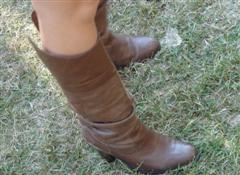 Also, did not see a lot of cowboy hats and boots at the game. I do not know where they went from Gameday to the game, but that was the case. One more random stadium observation…the ramps at the stadium were built on a grade that had to be less than 3%. It took forever to walk to the upper deck going back and forth. Why couldn’t they grade the ramps so that it did not take 30 back and forths to reach the top? Nightlife in Austin after the game seemed pretty intense…a nice win and a lot to celebrate. Sunday came and away we went back to New York. > Austin as a whole was a little disappointing. It could have been the burden of high expectations as based on what I had heard I expected to love the city, but it just did not happen. Nice city, but I do not see what all the hype is about. > We never got the BBQ we had been craving. More disappointment. > Cabs in Austin seem to be somewhat sparse. > The service road system to the major highways is completely screwed up, but the concept of double-decker highways was solid. New York, take a lesson. > What was the deal with the girl in the Ohio State gear at the airport who walked past us 8 times while talking loudly on the phone? I hope this is not an ominous sign about Ohio State fans. The write-ups do get better. It took some games for us to realize taking notes was a good idea and some additional games to find our stride. Please bear with us during the first few.